The Book of Proverbs lends itself to an instructive daily reading program, due to having 31 chapters of accessible length. A big advantage to doing this is that, after repeating the course for a while, one begins to get a feeling for some of its important characters, ones whose names may cause us to misinterpret them at first. One such character is “the simple”, and the motivation behind this post is a widespread tendency in the church to fail this fellow: He is in our congregations, and is in great peril, but not only do we often not “move heaven and earth” to rescue him, but we may even praise him for the very traits that endanger him! A “simple” person is wont to “turn away”, as the citation above from Pr. 1:23 indicates, when given advice. He doesn’t believe that life is as serious as his counselors tell him it is, or that things won’t just naturally work out as he wants them to do without all that much trouble. 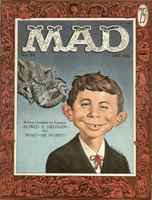 Alfred E. Newman’s mindset is his, “What Me Worry?” The John Wooden quote above also captures much of him - he already “knows it all”. In other words, a simple person is poised on something of a knife-edge: He can listen to the exhortations of his elders and turn to wisdom, or he can fall into folly - that is, become a fool. Like the “fool proper”, this type of fool would not listen while young, but his response, instead of “raging against the LORD” is a sort of befuddled whining against Him. He will spend his days, closeted uselessly somewhere, all the while wondering why things haven’t turned out better. But, as I asked at the beginning of this post, do we in the church really take the urgency of this situation seriously? Do we really see the simplicity of the young as Scripture sees it, a sinful and dangerous state? Do we respond as the Book of Proverbs does with frequent and frank exhortations to change? Or do we instead, ape the fads and fashions of the young, and corrupt our teaching and worship in order to attract those caught up in “the youth culture” (including a lot of so-called adults, who should know better by now)?